Harris 24 is a new service that promises the same quality survey design, audience reach, analysis, and reporting insight you’d expect from Harris … only quicker. Decisions need to be taken quicker than ever before. At the same time, the underlying data have to be reliable and robust to ensure valid decision-making with minimal risk. In response to this increasing need among today’s decision makers Harris Interactive has developed “Harris 24”, an innovative research tool delivering back results to you in less than 24 hours. — Harris 24 combines cost efficiency and high speed results with maximum flexibility. Covering more than 30 countries, Harris 24 gives you access to over 8 million consumers to answer your questions. For the major markets surveys with up to 2,000 qualified responses can be turned around within 24 hours. 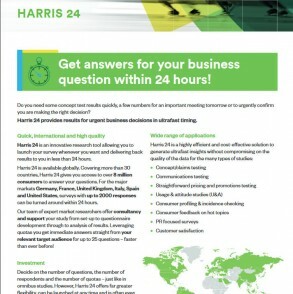 Harris 24 is a highly efficient and cost-effective solution for concept/claims testing, customer satisfaction, usage & attitude studies, … or simply to urgently confirm you are making the right decision. As a complete service including design and programming of questionnaires, field management and delivery of results, Harris 24 offers just the right mix of automation efficiency and research know-how. Harris Interactive has developed Harris 24, an innovative research tool delivering back results to you in less than 24 hours.